Hello and thank you very much for dedicating some of your valuable time to answer this interview. First things first. We would all like to know one thing: Why did ADRAMELCH end up splitting? Vittorio: The answer is complex, yet simple… after 12 years together, there was not much to give. Gianluca [A. Corona], the author of all ADRAMELCH’s music, was no longer interested in doing new songs and actually told us something like “the vein is drained, there’s no more music left”. Being in such a position we had only a couple of options: to move forward with new music written by the rest of us, or do concerts playing the old stuff with a new guitarist, thus replacing Gianluca. Both were “no go” strategies. ADRAMELCH’s footprint is the music written by Gianluca and, like it or not, will always highly recognizable. And surviving only as a performing band? Our main interest was to create new music, so performing the old stuff “live” without Gianluca was not in line with our passion. That is what led us forward. Next chapter for some key ADRAMELCH members. A new band. But wait a minute! This is not the first time that Vittorio Ballerio (vocals) and Fabio Troiani (guitar) have worked together on a project. My time machine takes me back to the the 80’s and your project ANATHEMA. From 1986 to 1989 if I am not mistaken. Why was this project so short-lived? Fabio: I’m thankful for my time in ANATHEMA as it gave me the chance to get to know Vittorio! ANATHEMA was also important for me because I entered the studio for the very first time when we recorded a four-track demo. I had to quit the band to do my military service – unfortunately, at that time joining the army for a year was mandatory in Italy – and Vittorio wasn’t interested to stay in the band, so the band split up soon after that. People keep asking me about ANATHEMA’s material. Can you please “officially” list your releases? It’s important to be done by the creators themselves. I think there were two demo releases, right? Vittorio: You’re right again, two demos. But Fabio and I were only on the second one, the one called “Salem Lunacy”. The first one was the same-titled “Anathema”. Fabio: We don’t even own a copy of that cassette! Given you’ve been working together in CARAVAGGIO, do you have any thoughts of resurrecting ANATHEMA at some point? Fabio: No, absolutely not! There is no musical path leading from ANATHEMA to CARAVAGGIO except for the presence of Vittorio and myself. So, a new band and a new chapter in music for you. When did the idea of forming a new band came to you? Vittorio: Cooperation with Fabio on these new songs goes back to 2015… it started with me singing on a few demos that were prepared by Fabio (guitars and midi). The idea from the very beginning was to create something unique driven by our passion for different genres of music, but always keep Progressive Rock as the “red thread” in what we do. We were both born under Heavy Metal and none of us wants to deny or overlook this! The “apparently” new element in our music is probably a Mediterranean touch that colors our compositions. The country we live in and its traditions have a certain weight on our lives and it’s something that reflects on our approach in music as well. It makes sense for us to give it the space it deserves. CARAVAGGIO. Why did you choose the name of a famous Italian painter for your band? Do you feel it somehow describes your music? Fabio: Our music has “vivid colors” and “strong contrast”, just like Caravaggio’s works. You describe your music as “Progressive Rock”. Can you please be more specific about this? Fabio: It is not easy to describe our music. Being the main composer of this band, I have to say that I don’t think in terms of musical genres anymore. Throughout the years I have played so many different styles of music, and now it seems that all these styles add new “color” to the songs I am writing. Of course, we can simply say that CARAVAGGIO is a rock band, but some of our influences come from 70’s hard rock, world music, jazz, classical and more, resulting in a unique progressive sound. The current line-up features Marco Melloni (previously bassist with VANADIUM’s singer Pino Scotto) and Alessio “Einsamkeit” Del Ben (for a short period drummer with WOTAN). How did you get in touch with those people? Alessio has the great merit of reducing the band’s age average – he’s 25! 🙂 Jokes apart, Alessio is a super talented professional drummer, that has a number of experiences and awards despite his young age. He was the winner of the 2017 Percussive Arts Society, an important international contest among drummers from all over the world! Again, the reals “pros” for Alessio, is the approach he takes: he’s ready to offer his proposal, his view on the song, his rhythmic interpretation, but also willing to change and adopt in the way it fits the song best. Because at the end, the “golden” rule for all of us is to push the song to its best. 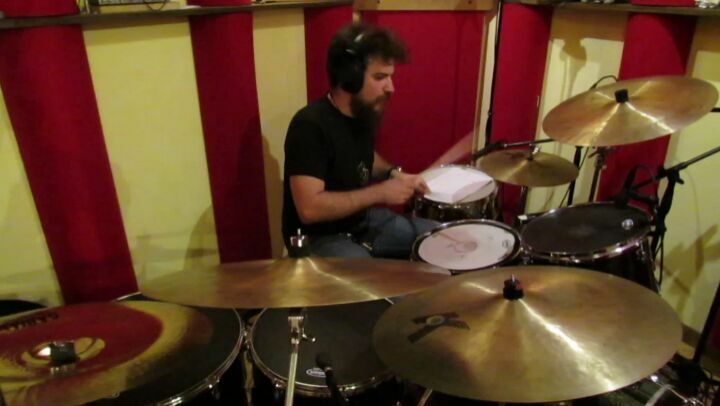 On June 2018, CARAVAGGIO entered the studio to record some rhythm tracks for their first album. How are the recordings going so far? Fabio: We have recorded drums, bass and guitars for six songs. Then we had to stop the recording sessions to get back to the rehearsal room and arrange four more songs. We are pretty sure that the album will feature ten songs in total. But there’s a bunch of work to do… Be patient! Taking a look at your Facebook page on some recent – early December – photos you have posted, I noticed some additional musicians. On an earlier press release, you stated that “Through the recording sessions other musicians will join the band: a keyboards player, a percussionist, an accordion player”. Who covered those slots? Fabio: While composing a song, I’m used to write the arrangements for other instrument as well, not only for the guitars. So I knew we needed these musicians in order to achieve the right sound, even if I didn’t knew who would fill the positions at the time. At the moment I can’t say any names. We’ve been in contact with some interesting musicians but we have not decided yet! I even noticed a photo showing a Bouzouki! Are you going to include this Greek instrument on your material as well? Fabio: Absolutely! I have already recorded the bouzouki parts on three songs. I love his sound. I’m using it to double or even replace some parts of the acoustic guitar. 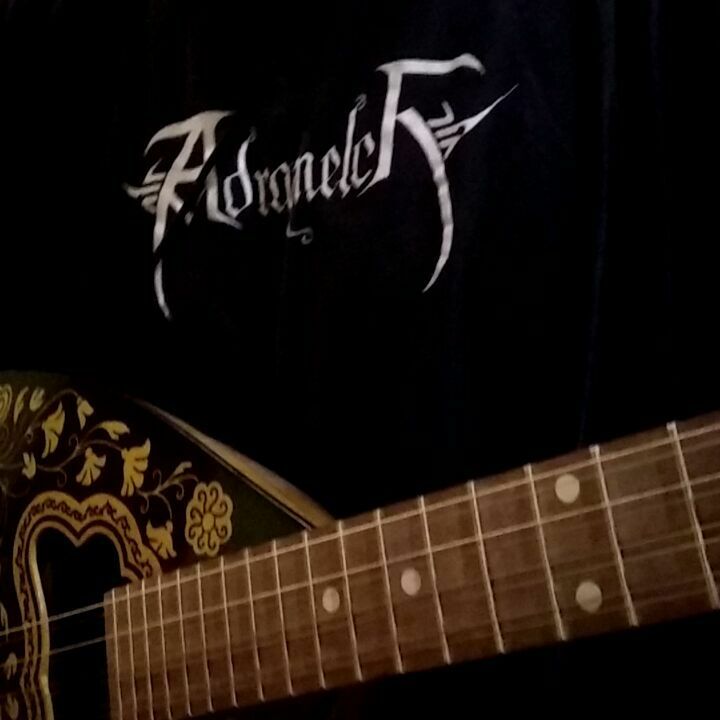 I have to admit that I’m not really a bouzouki player, so I changed the tuning in order to play it like a guitar! Accordion and Bouzouki, it seems to me that we shall discover a special Mediterranean touch on your music. Or not? Vittorio: BINGO! Mediterranean flavour is one of the distinctive marks! Fabio: And don’t forget the mandolin! You have already announced a single release. Can you elaborate on that please, giving us all the useful info? Fabio: The song is titled “Before my Eyes” and it’s about the political use of our fears. Our leaders want us to be constantly scared of something. If we haven’t got enemies… they will create a brand new one for us! We have decided to release this song as a single to give a sign of life as soon as possible, months before the release of the full-lenght. And what about the complete album. Is there a release plan yet? Have you signed already, I mean with a label? Fabio: There’s no release plan at the moment. We are not getting in touch with record labels and nobody has listened to our music, except for the single. Our plan is just to release the album in 2019. Focusing more on the music. What inspires you the most to create this special new material? Who’s responsible for the compositions? Vittorio: Fabio is the Deus ex Machina for CARAVAGGIO, just like Gianluca was for ADRAMELCH. He’s the real owner of the project. Naturally, arrangements always gather suggestions from all of us and the rehearsal always brings new elements to the light, but the rainmaker is Fabio! If I asked you to describe your music using some drawing definitions, would this be a difficult task? Or let’s put it that way: If your music was a painting from which period or drawing genre it would be? Vittorio: Hmmm interesting question… you know, we all (the young Alessio included) love the 70’s and most of the bands of that era. The titans of Progressive Rock like YES, JETHRO TULL, GENTLE GIANT or GENESIS are well known and beloved by all of us. But just because of this, none of us is interested in doing music that sounds fully 70s! That “space” is full. I mean, these bands produced the music we love, no one needs a new band playing old stuff. The challenge we choose is drawing on different roots (our ADRAMELCH years, 70s Rock and Prog rock, the Mediterranean flavour) through the lens of a modern, open approach to music. Fabio: Yes, very colorful, warm, elegant… Italian Renaissance? Vittorio: We may soon have something to show! How is to work with a producer like Guido Block? Shall we expect a sound similar to “Opus” thanks him? He became a bass player and a singer (as you may remember he was guest on ADRAMELCH’s “Opus”), and eventually a producer! I have to admit that in terms of sound, “Opus” is indeed the best ADRAMELCH album. Therefore I’m definitely sure that he will also be able to capture the best of CARAVAGGIO. The recording sound really great so far and I have good reasons to be very positive about the outcome! Do you plan to setup a live shaping for the band? Vittorio: Sure we do! We would love to bring our music on stage. Still don’t know how, which line up would that be… but it will happen! Everyone on those Instagram photos is wearing ADRAMELCH shirts. Is there still hope? Well, that was all for this first interview. Close it as you like! Thanks a lot! Fabio: We thank you a lot Chris. This is our first interview as CARAVAGGIO, so you gave us the chance to explain what we are going to do now, especially to the fans of ADRAMELCH. Vittorio: Thanks indeed Chris! Hey guys! trust you will follow and support us in this new adventure! Stay tuned!